For all the uncountable love your parents have showered upon you, it’s your time to bring some sweet joys on their anniversary. So, order anniversary gifts or send anniversary gifts for your parents across India from FlowerAura. We all have an enormous sense of gratitude and appreciation for our parents. They have a profound impact on our lives which often go unnoticed. They give so much of themselves and when it’s the time perfect enough for us to acknowledge it, we fail to show it. But there are some special days like anniversaries when compassionate expressions in the form of flower bouquets and presents do make a difference and touch the chords of their heart. Besides, honouring them stirs something deep in our soul too. With FlowerAura, send anniversary gifts for parents online across India and express your love for them. FlowerAura understands your feelings and to make your task a lot easier, it has in store a plethora of exclusive anniversary gifts for parents. We have a wide and amazing collection of anniversary gift ideas for parents that are sure to convey your love and affection for your parents. We also contain gifts according to the anniversary by year. So, be it a 25th anniversary of the 50th anniversary, our range of attractive gifts will make your parent’s anniversary memorable. Since FlowerAura is a well known online florist, it has beautiful anniversary flowers for parents. If you are looking for a perfect anniversary gift for mom and dad then, order floral arrangements online from FlowerAura. Send your epitome of love with brilliant gifts and flowers we have specially designed for expressing exactly what you want. We have a wide range of anniversary gift ideas for parents like bunches of roses, soft toys, flowers, coffee mugs, cushions, chocolate hampers, gift baskets and other hampers. No matter which city you reside in, have your anniversary gifts delivered anytime, anywhere via FlowerAura’s express delivery. Since it’s your loving parent’s anniversary, how can it be complete without a delicious dessert? 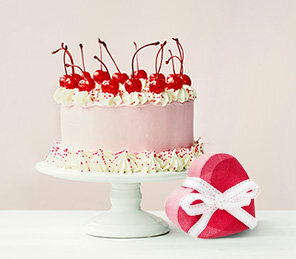 You can surprise your parents with a designer anniversary cake for parents from us and enjoy free shipping. FlowerAura offers you a convenient platform to make your orders for the amazing collection of mom dad anniversary gift. A hassle-free option to save your time and a beautiful way to strengthen your relationship with your parents, relatives, friends, and loved ones. Now you don’t have to rack your brain for ideas to make the anniversary of your parents a memorable one. Your only effort is to take some minutes out to browse through FlowerAura and make the choice that you think speaks best for you from our numerous anniversary gifts for mum and dad options. If you cannot express your emotions to your parents then, you can buy a card from our amazing collection of anniversary cards for parents. You have a busy schedule and you failed to plan the event? But, fret not, FlowerAura ensures you same day delivery and midnight delivery services through which you can make even the last-minute plan successful. Go on! Make everlasting expressions of your love for your parents with FlowerAura and weave moments of magic!